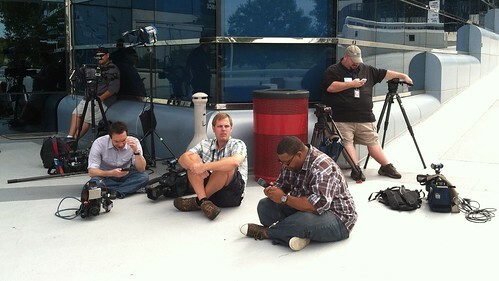 Perhaps the coolest thing about the crush of cameras outside John Edwards' indictment hearing is the fact that I wasn't there. (Instead, I was thirty minutes away,babysitting a big ole hole in a nearby Apple Store and wondering where in the hell everybody was. Now, I see.) That, friends, is a respectable collection of press representatives - one befitting a visiting prince, a shackled Sasquatch, or some preening worm who cheated on his dying wife with a (GASP!) vid-ee-OG-ruh-fer. That's right, I - like most North Carolinians - consider John Edwards to be a nothing short of a greasy orifice. Back when he was a media darling, we'd travel to his hometown of Robbins for a chat with his longtime supporters. There were none. Then there was the time I waited outside the Koury Convention Center for his limo to arrive. When it did, he bounded out, all teeth, dimples and feathered bangs. I didn't like him then. I don't like him now. Of course you might think my low opinion of the man would compel me to be present when a Federal judge laid six hefty charges on him. You'd be wrong. See, a scrum of that number doesn't form without a few bumped shots and bruised egos along the way. Be it for a fallen lawyer or rising Idol, reception parties of that magnitude usually devolve into madness. Especially when man in the middle of it all stops for a few more seconds of face time. That's just what Edwards did today and while the world may have hung on his every syllable, I spent the interview scanning the backdrop for familiar, pain-racked faces. There - among the out of town stringers and network jet-setters - that guy ... who I see every week but whose name I've never learned. He looks...constipated. And over there, in front of that dude on the ten foot ladder, it's El Ocho's own Joe McCloskey! Why, he must be positively entranced with the political drama at hand, thrilled to be a part of tar Heel history, breathless with anticipation at what scandalous nugget will be revealed when Mr. Aqua-net emerges from the Hall of Justice. Isn't that right, Joe? ... Joe? "I was staking out one entrance for two hours, Duffer was at another one, and the Chief showed up and thirty seconds later... Johnny walked past his camera." Ahhh, spoken like a seasoned professional who'd rather be anywhere but in the middle of it all. He should have joined me at the Apple hole. Chick Fil-A showed up and handed out free sandwiches. You don't get THAT at federal indictments. Do you? Yeah, just surf around for a minute so I can get some video... Hmm? Doesn't matter what you click on I won't show the screen. I'll shoot that back at the studio so I can get all fish-eye on it. No, I just need you to act like my kids and ignore me. Just sit there and click around, never the mind the fact that a strange cameraman is hovering over you, zooming in on your every eyebrow twitch, isolating your least favorite body part. Don't be nervous. I'm not. In fact, I once shadowed a group of street performers as they prepared to jump a nearby mime and I never once broke a sweat. Hmm? I dunno - I think he was selling weed on their turf. Just do me a favor and don't look at ME, look at the COMPUTER. You can play Angry Birds on that thing, I don't care. Just give me a few seconds of silent focus or else my entire lower body's gonna fall asleep. You know, I once wanted to make movies, but then life and lack of talent kicked me square in the 'nads...now I'm here with you. Just feel lucky I don't make you do one of those weird walks to nowhere, 'cause people hate that. Hey, ya know what I hate? Folks who don't trust the cameraman when he says 'act natural'. If you'll do just that. I'll be out of here and making love to a drive-thru value meal before you can power down that laptop. Trust me. I'm a professional. I've shot chopper landings with no viewfinder, ant farm conventions without a tripod and Presidential debates without the proper press pass. I got this. Just do me a favor and stop looking over here. I got an early morning live shot tomorrow and I'm going to need some sleep before I get up and mismatch my sweatsocks... No? Can't even pretend for a moment that I'm not here? Tell ya what, sport. Just go down to the end of the hallway and walk back toward me all natural like. I probably won't even use it. Hmm? What should you do with your hands? Uh, grab a clipboard and radiate importance. Just...walk. I'll be wedged in that corner by the ferns, wishing I'd paid more attention in high school. You can act like my guidance counselor and ignore me. I'm begging you - please! Turnstile etiquette at the DMV, a recent dearth of butter-beans, fresh outrage over inner city sidewalk height ... the stuff we cover will put you under. But every once in a while something cataclysmic happens and you just happen to be there with a viewfinder in your face. Such was the case Friday when nothing less than Blackbeard’s anchor (BLACKBEARD'S ANCHOR!) broke the surface and to my eternal regret, I wasn’t there to receive it. Richard "RAD" Adkins was, however, but he explains below how he nearly wasn’t. We ALMOST blew this assignment off.... other pressing issues, holiday weekend, short staff due to vacations... Glad we didn't. Once the Anchor actually broke the Water's surface, I thought Man! Just like in the Popeye Funnies! Is was a stereo typical old fashion anchor. And covered with just what you'd think, right out of the Dead Man's Chest. Once on board, a star fish actually fell off the thing. We has some decent waves on the trip out, and a few fellow media types started getting green... Once we arrived on site and started to drift, I overheard the captain ask a mate to "Pour some Tide down the head to reduce the fumes", I assume someone got sick in there. 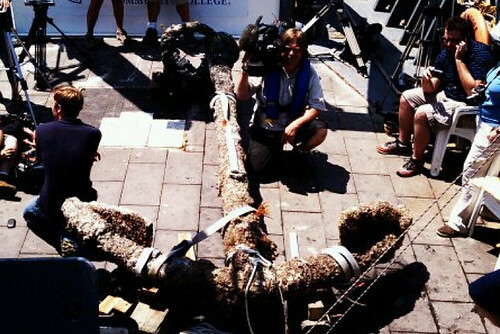 There are a few stories I get geek about... this was one, once I got a good look at the anchor and realized just how cool it was to be that close to Blackbeard's ship, I did get someone to take a picture of me with the anchor. It proves I'm a goober, but hey, At least my daughter thinks I'm cool. As do we, Adkins. As do we.